Zambia’s Presidential election was held on August 11, 2016 for the second time in 20 months. After the ensuing post–election drama, Edgar Lungu has emerged the winner, proving to the country and the sub-region at large that he was not the political lightweight that some might have thought him to be. 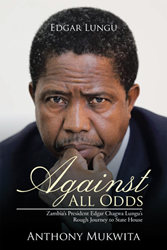 Set for a new marketing campaign, “Against All Odds: Zambia’s President Edgar Chagwa Lungu’s Rough Journey to State House” (published by Partridge Africa) written by Anthony Mukwita is about Zambia President Edgar Lungu as well as about African democracy and leadership. It is also about Zambia, the proverbial last bastion of peace in sub-Saharan Africa and about the great people of the southern African country. “I was inspired by President Edgar Lungu's sheer will to survive against all obstacles thrown at him by his political nemesis in Zambia. He showed that you can survive the worst storm if you are tenacious,” the Zambian born journalist and top-ranking diplomat says. "I would like to be remembered as an ordinary man who became President, a man who showed that if you are resolved you can make things work for the greater good of your people," — Edgar Chagwa Lungu, President of Zambia. Anthony Mukwita is an accomplished, award-winning Zambian writer who has won a World Bank Investigative Journalism Award that saw him get attached to the prestigious Bureau of Investigative Journalism (BIJ) in London, United Kingdom, in 2012. He worked as managing director for Zambia’s largest-selling daily newspaper, the Zambia Daily Mail, whose transformation he was a key. He holds a master of professional communication with high distinctions from Australia’s Edith Cowan University, where he studied full time before proceeding to work as a correspondent for Bloomberg. At the time of writing the book, Mukwita was the deputy ambassador at the Embassy of Zambia in Stockholm, Sweden. He now lives with his family in Berlin, Germany where he is Zambia’s Ambassador to the Federal Republic of Germany. Mukwita has travelled widely in Zambia and abroad, a prolific and colorful writer, the Zambian-born journalist brings to the literary world an extra body of knowledge and flair previously absent in Zambia and Africa’s history. Partridge Africa, a self-publishing imprint of Author Solutions, LLC, provides publishing and marketing services to writers who wish to become published authors. Partridge Africa offers a step-by-step publishing process where authors are assisted on their journey to holding a published book in their hands. Services include online book distribution, book availability in print and e-book formats, cover and layout design, and marketing and editing services, among many others. For more information, visit http://www.partridgepublishing.com/africa or call 0800 990914 (Toll Free in Africa). Check out the latest news at facebook.com/Partridge-Africa.